"Great liqueur for Christmas drinking or Christmas gifts. 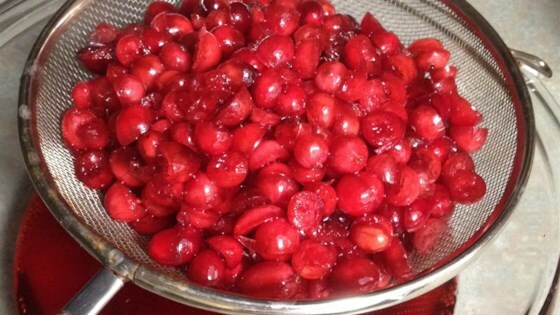 Cranberry solids are great for making cranberry loafs (with a kick!) Very good served with soda water and orange juice." Combine cranberries, sugar, gin, and vanilla extract in a large sterilized jar with a tight-fitting lid. Let stand at room temperature for 6 weeks, shaking at least once a week. Pour mixture through a sieve and discard solids. Store in an airtight container for up to 2 months. I used vodka as I don’t like gin- best liqueur ever! Put it in pretty bottles and gave as gifts for Christmas- everyone loved it. Great with some seltzer too! taste good so far! now I got to wait 6 weeks. hehe!! I added blueberries also bc I didn't have enough cranberries.